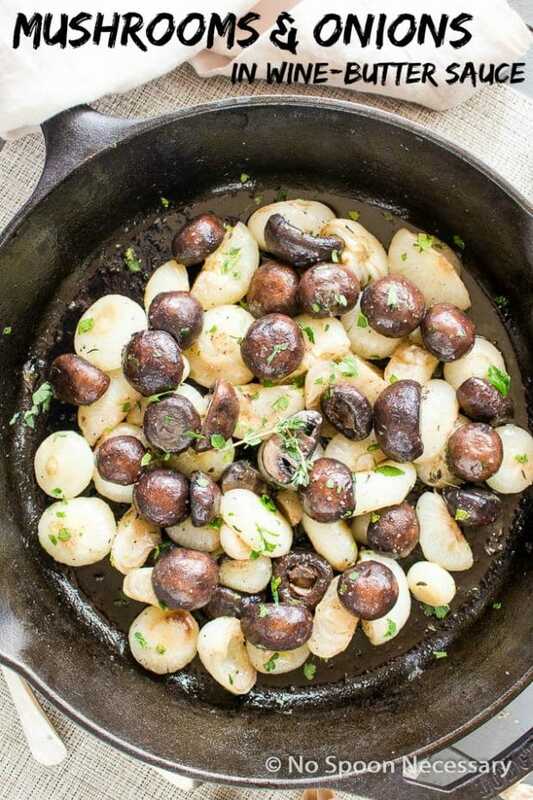 These Roasted Mushrooms & Onions in Wine Butter Sauce are a spin on the mushroom side dish at The Outback Steakhouse. 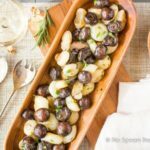 Ridiculously quick and easy to prepare, plus rich in texture and flavor, this delicious side dish is perfect for both easy weeknight dinners and holiday entertaining! These ‘shrooms and onions are slightly inspired by the mushrooms you can get with your steak at the restaurant where there are “no rules and everything is just right”. Although, I’m not sure about the legitimacy of their slogan. I’ve ordered plenty of items that were just all wrong. But, all in all, their food is reliable and pretty good for a chain, in my humble opinion only. I mean, they do have some pretty dang tasty items on their menu… hellllllo bloomin’ onion. Obviously, I am not going to make (or post) some mediocre copycat version of the ‘down under’ restaurant mushrooms. do not roll like that. 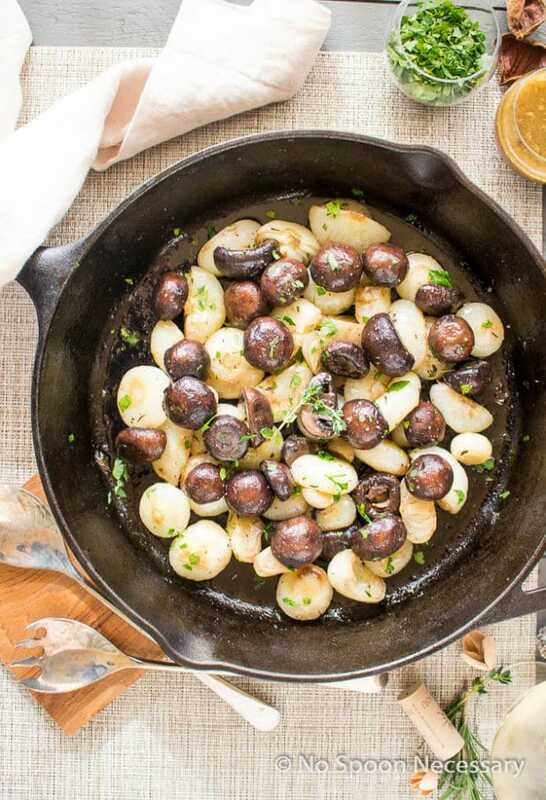 AKA roasted baby bella mushrooms & cipollini onions in a luscious white wine and garlic infused butter sauce. 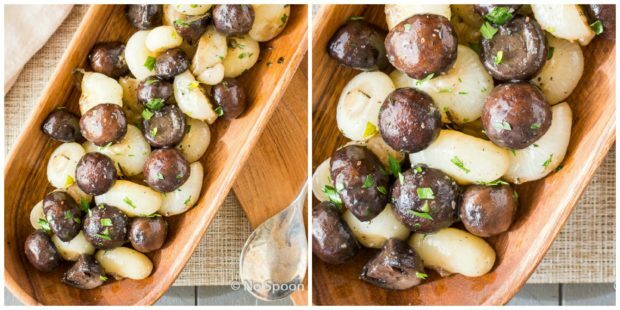 This side dish is seriously scrumptious in every possible way. Roasted for caramelized flavor, the baby bellas are meaty and rich in texture, while the cipollini onions are slightly sweet in flavor and meltingly soft in texture. Both vegetables pair wonderfully with the lightness of the white wine butter sauce and the subtleness of the roasted garlic. 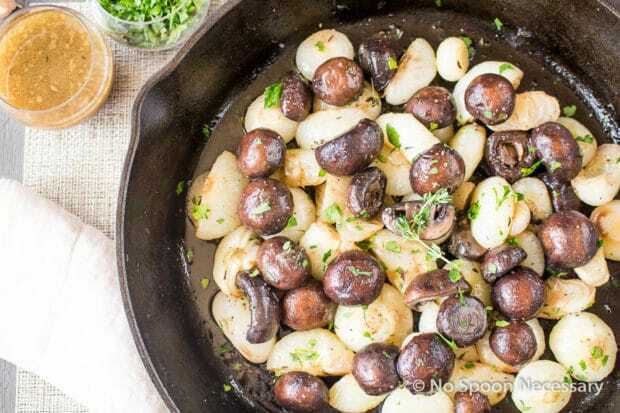 Not only is this Roasted Mushrooms & Onions in Wine Butter Sauce side dish absolutely delish, it is also quick and relatively easy to assemble. To me, and I am sure most of you, this is quick and easy prep is very appealing, especially during the holidays. 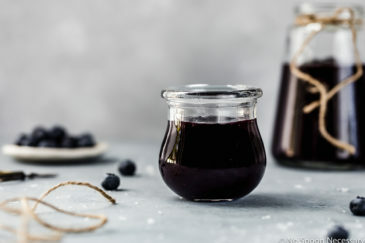 With no need to slave away in the kitchen, you can actually have a glass of wine (or two), mix and mingle with your company, and enjoy the special day with your loved ones. I served these Roasted Mushrooms & Onions in Wine Butter Sauce with a herb crusted standing rib roast. Together they made an elegant, charming, stunningly perfect Holiday Main. And, something you should most definitely have on your holiday table. 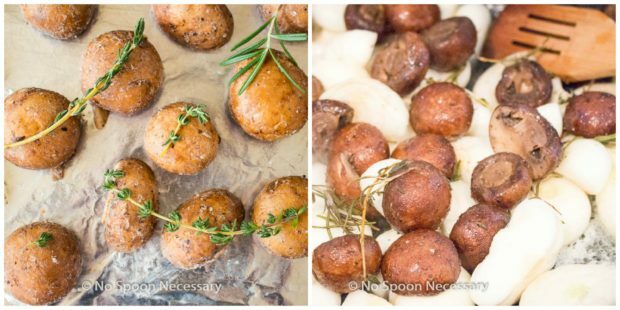 However, this side dish would be wonderful with roasted chicken, or a simple steak. 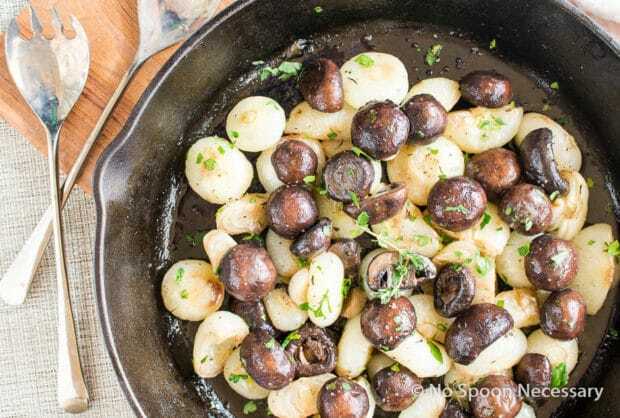 Regardless of how you chose to serve these Roasted Mushrooms & Onions in Wine Butter Sauce, I can guarantee you will love it! 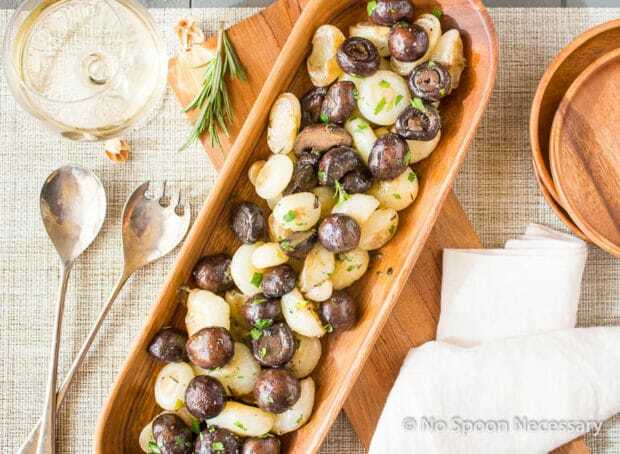 So put on some holiday music, make yourself a Hot Toddy and have a happy holiday with these yummy ‘shrooms and onions. 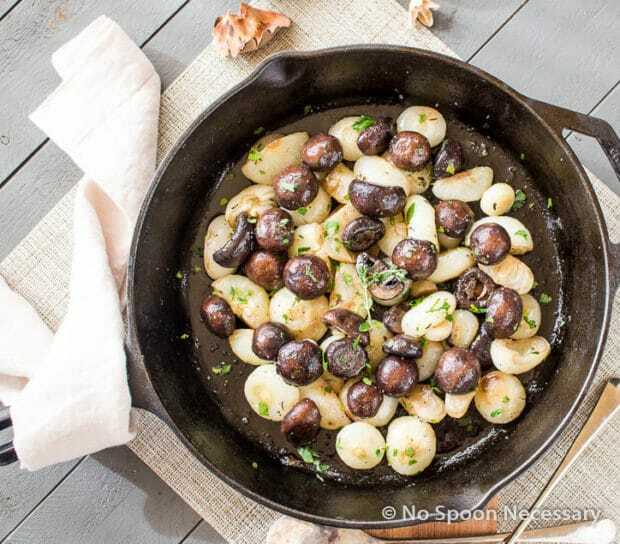 These Mushrooms & Cipollini Onions in Wine-Butter Sauce are a riff on the dish at The Outback. Quick, easy to assemble and rich in texture and flavor, this side is perfect for both weeknights and holiday entertaining! 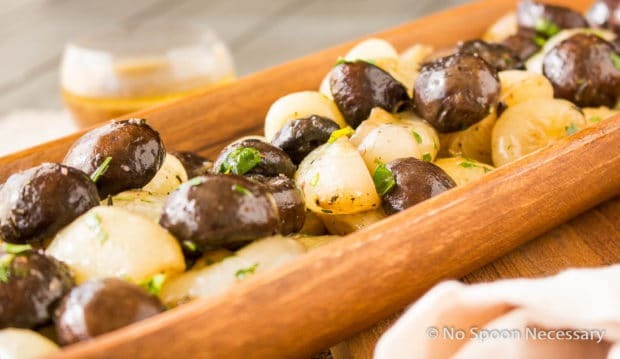 Toss the mushrooms with 1 tablespoon of olive oil and melted butter. Season with salt and pepper. 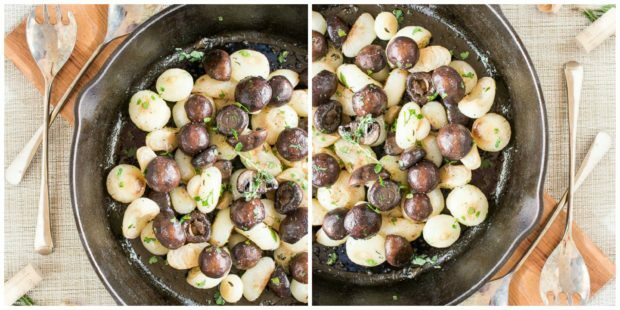 Transfer the mushrooms to the prepared sheet pan, cut or stem side down. Add the Thyme and Rosemary sprigs on top of the mushrooms. 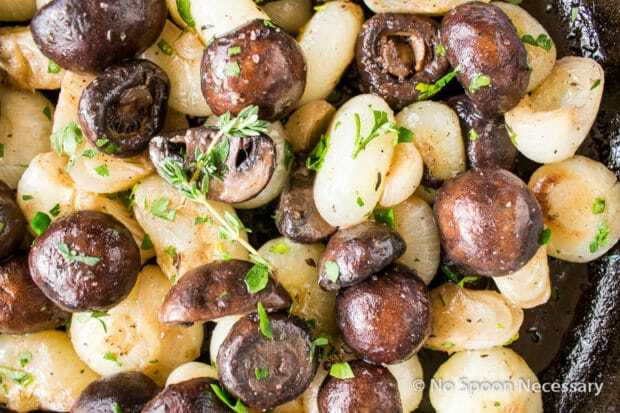 Roast the mushrooms and herbs in the oven for 15 minutes, or until the mushrooms release their liquid. Drain the mushroom liquid into a container and set both aside (you will need the liquid for the sauce). 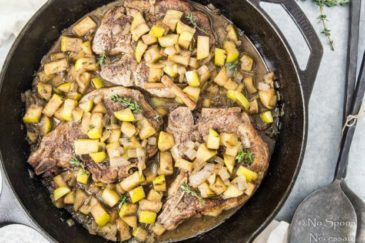 Melt 3 tablespoons butter with the remaining 1 tablespoon oil in a large cast iron skillet (or nonstick sauté pan) over medium heat. Add the onions, partially cooked mushrooms and sprigs of herbs. Toss to coat and season with salt and pepper. Transfer skillet to the oven and roast, tossing (or stirring gently) occasionally an additional 30 minutes, or until the vegetables are tender and caramelized. Meanwhile, Make the Sauce: In a small saucepan melt remaining ½ tablespoon butter over medium heat. Add the garlic and season with salt and pepper. Sauté until fragrant, about 30 seconds. Add the reserved mushroom cooking liquid and the wine. Bring contents to a simmer and cook until liquid is thickened and reduced by half, about 10 - 15 minutes. Add the cornstarch and stir it into the sauce. Taste and adjust for seasoning. Discard the thyme and rosemary sprigs. Toss with the sauce and parsley. Serve immediately. *Do not wash your mushrooms, instead use a dampened paper towel or a pastry brush to remove dirt. Wow, this dish looks absolutely amazing! I can totally imagine having this at home! Delish! Kristi, Thank you so much for stopping by NSN!! 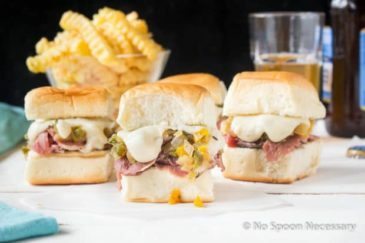 I’ve been to your blog filled with yummy photos and delicious recipes! So your kind words mean a lot! 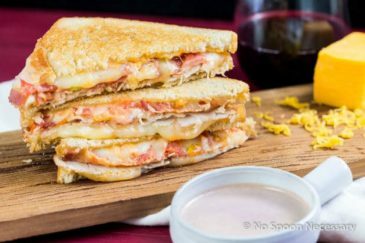 🙂 This dish was very delish, and pretty simple to make… a favorite combination of all, right? Cheers (and thank you again)! If it says wine and garlic I am in! I have decided to have an NSN and Cheyanne inspired Christmas dinner this year! Thank you my sweet friend! I love you! And your blog! 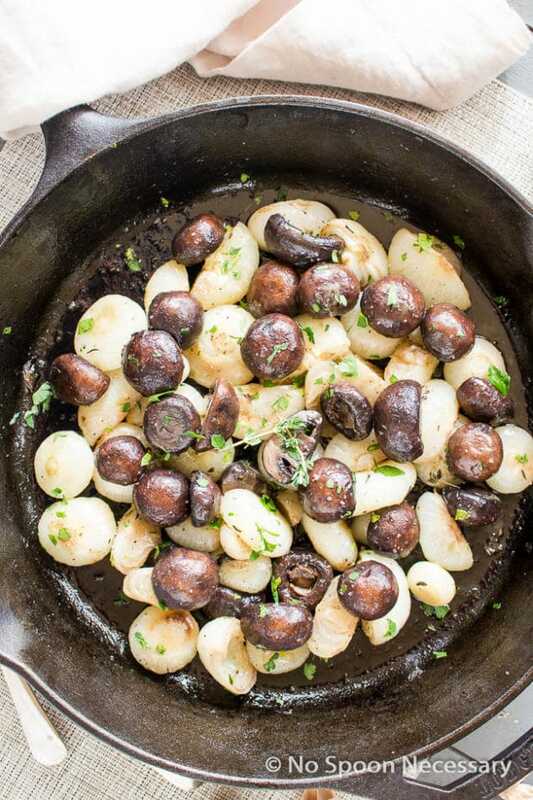 Mushrooms and garlic butter are two of my favorite things! This dish looks absolutely scrumptious. I’d kill for a bloomin onion for breakfast. Also your mushrooms look good too! !